In the prologue of Lord Kelvin’s Machine, Dr. Narbondo murders Langdon St. Ives’ beloved wife Alice which throws St. Ives into a funk. Part 1, titled “In the Days of the Comet” begins a year later. St. Ives has been depressed since Alice died and wonders if he’s bound for the madhouse like his father. Then he hears that Narbondo has hatched another devious plan which involves a comet that is coming toward Earth. Narbondo thinks he has a way to propel the entire Earth so that it will intersect the comet’s path and be destroyed. To do this, he must use a device created by Lord Kelvin which will reverse the polarity of the Earth. 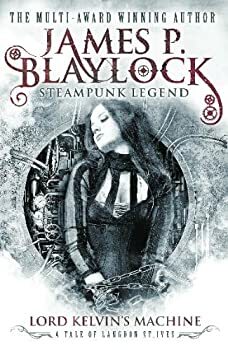 (Obviously this is absurd, but that’s part of what makes Blaylock’s stories so much fun.) Using some clever manipulations and some biscuit crumbs, St. Ives and his friends are able to foil Narbondo’s dastardly plot. At the end, Narbondo dies … temporarily. The second story, “The Downed Ships,” is narrated in first person by Jack Owlesby, a friend and great admirer of St. Ives, who witnesses the explosion of a paper company’s warehouse. It seems a little too coincidental that the paper company shares a wall with the Royal Academy museum which is currently housing one of Lord Kelvin’s machines. Something is afoot and it seems to involve a rubber elephant, an ice house, an American sailor, a sadistic boy, a fruit basket, a bomb, and a carp. There’s also alchemy, vivisection, and necromancy. In the end, it turns out that Narbondo wasn’t quite as dead as had been hoped. That was it — the difference between us. He was a man with destinations; it was that which confounded me. I rarely had one, unless it was some trivial momentary destination — the pub, say … At the moment, though, both of us slipped along through the fog, and suddenly I was a conspirator again. A destination had been provided for me. I wished that Dorothy could see me, bound on this dangerous mission, slouching through the shadowy fog to save St. Ives from the most desperate criminals imaginable. I tripped over a curb and sprawled on my face in the grass of the square, but was up immediately, giving the treacherous curb a hard look and glancing around like a fool to see if anyone had been a witness to my ignominious tumble. In the final section of the book, “The Time Traveler,” Langdon has managed to steal Lord Kelvin’s machine from the Royal Academy. He plans to use it to travel back in time to prevent his wife’s death. What follows is another madcap steampunk adventure, but this one is full of time paradoxes. I thought it was amusing in a preposterous way, but readers who hate these types of stories (I understand there are some) will probably not enjoy it as much as I did. You’ve really got to suspend disbelief for this one. Lord Kelvin’s Machine is one of the more entertaining LANGDON ST. IVES adventures and it’s a fine place for new readers to start. I recommend the audio version because Carrington’s upper crust British accent adds to the experience. “… wasn’t quite as dead as had been hoped.” Kat, that’s hilarious! I tried another one of these and couldn’t quite get into it, but this looks accessible and fun! Marion, I think I’m the only one around here who likes these. I wonder how much of that has to do with the audio versions. I love Blaylock’s absurd deadpan humor and the right narrator can really emphasize that and make it even funnier. As you know, I’m not big on audio books, but these might be perfect for the car.